We know tires are inconvenient to store when out of season; they're heavy and take up a lot of space in your garage or basement. But, did you know that moisture, sunlight and corrosive liquids, such as gas, affect the longevity of tires? We ensure our storage facility is dark, cool and clean to protect your tires. 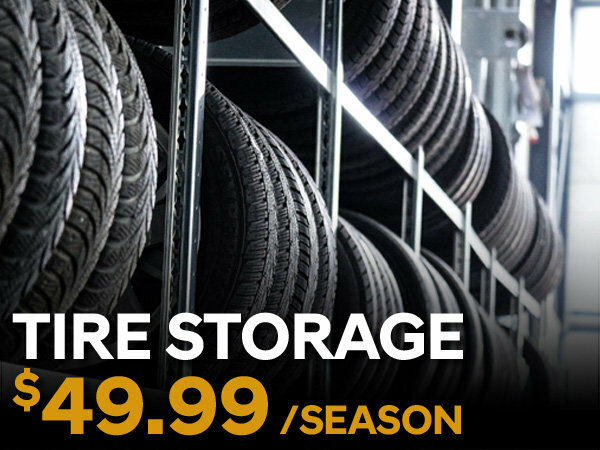 Our tire storage makes seasonal tire swaps easy. Simply book an appointment, and our technicians take care of getting your tires out of storage! Store your Tires with us for just $49.99* per season. Storage space is limited! Contact us today to reserve your space!